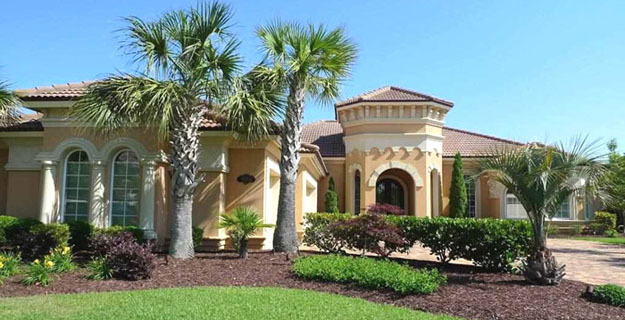 The elegant Mediterranean-style homes of Members Club in the Grande Dunes community have elevated this subdivision to a new level of luxury. Nestled between the Intracoastal Waterway and the gorgeous Members Club golf course, these homes offer spectacular views of lakes, the marsh, ponds, a nature preserve, and lush greens, with access to the Intracoastal Waterway. This very exclusive neighborhood has only 54 home sites. Read more about Members Club real estate. Members Club opened about 2006 and is full of the charm befitting a Grande Dunes community. The large beautiful houses offer 3 or more bedrooms and are loaded with every upgrade and convenience imaginable. Designer kitchens with formal dining rooms, libraries, trey ceilings, glass enclosed showers, and beautifully landscaped entertainment areas with outdoor cooking facilities are just some of usual features. There are pools, hot tubs, and some homes even have elevators. You can purchase an older home, a newly built house, or choose to custom build a home with one of the available builders. Prices start at about $600,000 and run into the millions. The incredible 27,000 square foot Members Club Clubhouse has a beautiful veranda with a view of the 9th and 18th greens. Besides 18 holes of Championship golf, the club offers a pro shop, a library with a lounge, game room, and a number of dining options including terrace dining. As homeowners in a Grande Dunes community, residents also have access to the amazing Ocean Club with private beach access, oceanfront pool and much, much more. Without a doubt, Members Club is one of the most stunning communities on the Grand Strand. To learn more, call our Grande Dunes expert, Greg Harrelson, at (843) 536-8383 or schedule a private tour of the homes for sale in Members Club at Grande Dunes.